How much ‘More Europe’ is enough Europe? Yesterday in Rome, the European Commissioner for the Internal Market, Michel Barnier, announced the EU’s proposed banking union would be “the biggest project since the creation of the euro” and must be accompanied by greater fiscal and political integration, eventually leading to a more powerful European Commission with a single directly-elected EU President. Barnier is expected to unveil ambitious new draft legislation for an EU bank resolution mechanism tomorrow. A banking union… is only part of the solution as the euro area also needs a common ‘risk-free’ asset or ‘eurobond’ to use as a safe haven in times of crisis and to prevent the sudden evacuation of liquidity on the periphery of the euro area. 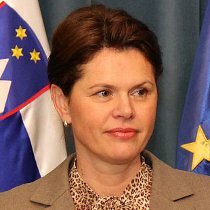 We took Peter’s comment to Alenka Bratušek, Prime Minister of Slovenia, whilst she was in Brussels at the recent EU Council meeting. Would a banking union be a solution to the crisis, or will greater fiscal integration still be needed? No, the banking union on its own definitely isn’t a solution to the crisis. In my opinion, we will still need some closer fiscal integration. However, it is primarily up to each member state to do its ‘homework’ and put its own public finances in order. This has to be done not because of the EU’s requirements, but in order to leave our countries in a better condition for future generations. The way he puts it is coherent: the banking union is an important step but a single supervisor is not enough to break the vicious cycle. Yes, if you look it at it like this, then it is logical that there should be some form of mutualisation of risks… but we have to realise that politically this is not easy at all. We are still faced with national electorates and parliaments, and these are not popular suggestions. There is resistance to pay for others. With the single supervisor alone, it’s very difficult to break the vicious cycle. If the deficit is growing in Italy because there is no government, for example, there is very little that a single supervisor can do. Or, if you take Spain, the public deficit was very low until there was a transfer of private debt to the public sector. Everything is interrelated, and debt can move from banks to the public sector. Eurobonds in theory can offer a solution to that, and in normal economic conditions it can be a good instrument. The problem is, if you have a real crisis, as maybe we’ve seen in Greece, then you can’t avoid the democratic discussion and the issue of the readiness of people to transfer money. A fiscal union and effective banking supervision can no longer continue to be hated. It is absolutely necessary to re-produce [growth in] the primary and secondary sectors. It is necessary to return the industries that relocated to Asia. However, not everybody shares Antonio’s enthusiasm. When we interviewed Martin Callanan, a British Conservative MEP and Chairman of the Conservatives group, he argued that “More Europe” was definitely not a solution to Europe’s problems. The Banking Union: what is missing and what should be added? What do YOU think? Is “More Europe” a solution to the crisis? If so, how much “More Europe” is enough Europe? And is it possible to have a banking union in the EU without going any further in terms of fiscal and political union? Let us know your thoughts and comments in the form below, and we'll take them to policy-makers and experts for their reactions. Europe is too much of a good thing. Too much of a good thing is good for nothing. Long live Nigel Farage and UKIP! haha, Farage the corporate stooge? Don’t make me laugh. A federal Europe is a one way street. The problem is organizing the details during a major crisis will inevitably lead to mistakes and resentment. Do we have a choice though? No we don’t. This is the century of super powers and Europe can only compete through more integration. As Darwin said it is not the strongest of species that survives but the most flexible to change. Europe just like any organization is a mental construction. It is a concept. a simplification of the reality. A filter that you impose to the reality otherwise it would be too complex to grasb. in a way it is unreal. Thus when you say more Europe, you basically says more unreal things. The sole real thing are the “individuals” composing those groups, not the group in itself. We need thus more “reality” and indirectly it means more freedom for the individuals that we all are. If europe means less regulation (like it did for the borders and the free market), I’m all for it. if it is more regulations, for my own good as they say (meaning less freedom is good for me), then I’m totally against it. I believe that we will have “enough Europe” the moment we realize that whatever is bad for a given EU country cannot be considered good for another one, i.e. we should really feel as one family . Not at all. The real (and useful) change should begin from the restructuring of the national governments. For a medium citizen, it’s shameful to be hearing once and again that “citizens must do a great effort for their country to recover” when that means “you have to pay what the banks and institutions have spent without control and though you, citizen, are the victim and not the villain, you will be moneyless anyway cuz you’ll pay our debts anyway.” European Institutions should demand not so much economic help but the right work of the governments being able to administrate money properly. Are they waiting for Europe to be absolutely poor to realize that the economic abuse is destroying us? When will be any institution that SINCERELY defends our human right to live without threats and asphyxiated? We’re fed up with the European Institutions, our banks and our government. Institutions that defend themselves and make sure they fill their pockets with great amounts of money and don’t worry at all about they own system’s deficiency. Where is they work? Can we see it anywhere? Less Europe and more common (human) sense. If they all lived as most people do, European and each country’s problems would be fixed from one day to another. You know, I always admire human dizziness. 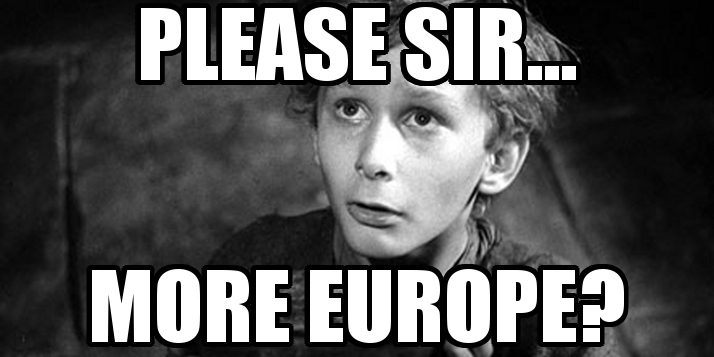 When someone asks More Europe? My first question is “What kind of europe?”. Since when has centralising and giving more power to one person ever solved anything in this world? South Korea did quite well, mind you. Centralising is necessary to achieve a homogeneous state, afterwards it’s easy to divide into regional bodies. Europe should first get everything in order at the current state it is. “More Europe” would only mean more problems, since expanding when many issues remain unsolved, would only expend the issues, not solve them. I think Europe should first get the Euro stabilized, increase the living standard, ecetera.. then when those issues are fixed and economy is stable, then we can start thinking of “More Europe”. I think that the further intergration is a very difficult task to conquer.We need “more Europe” as much as necessary to be consistent with its’ ethnocratic nature .It is very difficult to achieve a political union since the states won’t give up -justifiably- their state sovereignty. Instead of going for “More Europe” ,we should hope for “Better Europe”. We should focus, for example, to the elimination of the uneven development of states..
@ Jon How about Europe with no eu?. that will do me. Can’t see how more Europe in the current format would work, let alone be tolerable in the current environment. I’m all for simplifying laws that let people just get on with their life and aspirations within the EU, however new laws dictating how things must be done to live one’s life just seems wrong. In regards to harmonising banking rules, I can’t see how that ends well for anyone. More Europe indeed, but with more citizenship and less divisiveness. Barnier seems to forget that the EU lacks a ‘demos’ (a fundamental requirement for democracy) and therefore cannot be democratic, no matter how many elections there are. Saying ‘more Europe’ is the solution for the EU today is like saying ‘more Soviet’ was the solution for the Soviet Union at the time. If you learned anything at all from the 20th century, centralization of power is a bad idea and supranational unions imposed from above are bad ideas. Also, saying that it is a ‘one way street’ and ‘we cannot go back’ is basically saying the entire construct is undemocratic. After all, in a democracy there should always be a choice. What if all we need is some kind of economic cooperation? Anyway, fiscal union would be the death blow to our (Netherlands) pension system. So we’re not gonna sign up to that. I think you meant that the 20th century was the century of super powers. We do not need any super powers in the 21st century. (a) Constitution of commitees across all ministries of EU countries who will commissioned to develop and collect the necessary projects to develop the economy across all areas of activities in a country, province, municipality and village of the region. Cover all untapped demand potential in infrastructure, energy projects, ports and marine environment, industry and commerce, services like tourism and health. These economic sectors have been suffering a lot from continous recession and underfinancing. Should this continue the result will be higher unemployment and massive escape of capital to other countries . Therefore, joining efforts among EU states under a common vision of transforming the Union into a contemporary zone of attracting capital and investment should be the top priority for growth and development. How much “more Europe” is enough Europe ? I’d have to say something around -?. 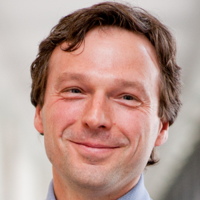 Isn�t that the objective of central banking? You are obviously opposed to democracy. these stupid politicians should start rescuing people,not banks. We need “some” Europe, but acknowledge diversity and soevereignity of countries. So let those things be arranged at european level, only those things that cannot be arranged at national level. No rules for the types of shoes for barbers for instance…..
Europe is thinking from a certain ideology, to have one europe with one EU, who helps all Europe. The idea of cooperation is nice, but people have the feeling the EU is trying to determin more and more things. The EU should acknolwedge diversity between countries, and only manage things that countries themselves cannot manage by themselves. This means in some cases: do less. For instance there should be no rules about what kind of shoes barbers should wear on a european level, or no rules for kindergardens as well. This should be arranged nationally. Not at all. The real (and useful) change should begin from the restructuring of the national governments. For a medium citizen, it’s shameful to be hearing once and again that “citizens must do a great effort for their country to recover” when that means “you have to pay what the banks and institutions have spent without control and though you, citizen, are the victim and not the villain, you will be moneyless anyway cuz you’ll pay our debts anyway.” European Institutions should demand not so much economic help but the right work of the governments being able to administrate money properly. Are they waiting for Europe to be absolutely poor to realize that the economic abuse is destroying us? When will be any institution that SINCERELY defends our human right to live without threats and asphyxiated? We’re fed up with the European Institutions, our banks and our government. Institutions that defend themselves and make sure they fill their pockets with great amounts of money and don’t worry at all about their own system’s deficiency. Where is their work? Can we see it anywhere? Less Europe and more common (human) sense. If they all lived as most people do, European and each country’s problems would be fixed from one day to another. First of all really poor choice of words when talking about “banker union” – the EU seems to be turning into this “union for the bankers” rather than for its people. Second of all, stop bloody blowing to yanks ! How can the world take you seriously and want “more Europe” if you’re jsut feeding us “more bowing to US”. We want more EUROPE, not more USA! To hell with the USA. More regulation on businesses. Less freedom to flee like rats to China or India. MORE taxes for cheap crap that comes from these countries. MORE regulations on safety for said junk. Punish severely planed obsolescence ! Punish corporate fraud, abuse and tax/rule evasion – enough to bankrupt them – and mainly their shareholders. Put your foot down on the neck of the leeches who are sucking us dry, THEN, maybe, we’ll take “more europe” seriously. Right now it’s just a tool for USA oligarchs and those forming here. We need a Europe that is equal to all the countries not divided into rich and poor, North and South!!! EU citizen votes are scaled according to population AND EU contribution – NO DISPROPORTIONATE TAXATION WITHOUT PROPORTIONATE REPRESENTATION!! It’s never enough! There is so much to do! More Europe is the answer! The EU is a mess of its own making. It is totally undemocratic and the notion that giving the EU Parliament more powers or making the commission president directly elected is going to change that is laughable. The good ship democracy sailed 40 years ago and we were denied passage. The reason for this is simple, the founding fathers of the European project did not believe in democracy. They thought it was dangerous and that it was the cause of many of the worlds ills. They were avowed believers in technocratic rule. The only way the EU can ever be democratic is if the fanatics driving the project realise that the people of europe do not necessarily share their vision and that the europe they build should be a europe the people want, not the europe envisaged by a few zealots. Take the Euro mess. It is a direct result of the undemocratic nature of the EU. It was not done because it was the right thing to do. The fact that they let countries like Cyprus, Greece, Portugal, Spain and a number of others, join the Euro when they did is testament to this. These countries did not meet the criteria when they joined the euro and have not met these criteria since they joined. The creation the euro was not economically motivated it was politically motivated. The intention was to chain as many countries as possible into a convoy heading towards the destination of a United States of Europe, a single nation state. It was then and still is obvious that once you had signed up to the euro there was no realistic way out no matter how strong your national economy was. The countries now in economic distress would face huge devaluation and economic and political turmoil if they left the euro with the result that exchange rates would make imports hugely expensive and drive rampant inflation. Stronger countries such as Germany would see the strength of their national currency increase thereby making their exports uncompetitive, driving up unemployment. So why was the euro rushed through? The answer is simple, it was the price France demanded for agreeing to German reunification. Germany wanted reunification enough that it conceded to French demands for the acceleration of the move to the euro, the result was that it was done too quickly, at the wrong time and without putting in place the necessary institutions to make it work. Why did France want to move so quickly? Because they wanted to ensure that as many countries were tied inextricably, to the project to create a european superstate, a federalised United States of Europe.